The vibrant and rather forceful works of the internationally known Dutch artist, Christian Karel Appel, painter and sculptor who helped to pioneer an unrestrained, physical style of painting in Europe in the period following World War II (after 1945). He was a leading light in the CoBrA group (*CoBrA :Copenhagen, Brussels, Amsterdam - the group of abstract artists originally started by Asger Jörn, Corneille and Appel in 1948. He moved to Paris in 1950 but in 1957 took up permanent residence in New York. He is a prolific painter and printmaker. The intensely colourful expressionist lithographs he made with L'Ouevre Gravée were the highlights of his graphic work and are much prized by collectors. Appel's work is distinguished by thick application of paint, violent colors, and vehement brush stroke combined with a sense of childlike naïveté. He have been displayed and well-received in major cities throughout the world. Born in Amsterdam, Holland on April 25, 1921, Karel Appel was educated at the Academy of Art, Amsterdam, the Netherlands from 1940 -1943.., After the isolation and oppressive atmosphere of the war years (World War II, 1939-1945) in the Netherlands, Appel was drawn to the raw, expressive work of French artist Jean Dubuffet, whose primitive imagery and energetic style contrasted with the more formal, geometric work that was dominant in Europe at that time. Appel first aroused public interest in 1946, when he was included in an exhibition entitled Young Artists at Amsterdam's Stedelijk Museum. In 1948, together with Dutch artist Corneille, Danish artist Asger Jorn, and Belgian artist Pierre Alechinsky, Appel helped form an experimental group called Cobra. Finding inspiration in folk art, children's drawings, and prehistoric art (see Paleolithic Art), Cobra glorified instinct and opposed rigorously intellectual approaches to art, aims it held in common with a similar movement in the United States, abstract expressionism.Appel has been inspired by a psychatric brochure titled "Psychopatological Art" to paint and draw a serie of gouaches with the idea that art can be the expression of a mental disease. Appel had his first one-man show in 1949 when he exhibited with the "Cobra" group (from the initials of the members' home cities: Copenhagen, Brussels, Amsterdam) at Amsterdam's Stedelijk Museum. In 1949 Appel was commissioned to paint a mural for the cafeteria of the Amsterdam City Hall. His response, a wildly colored painting of bitterly smiling children, so disturbed the employees who took their meals there that the City Council was pressured into ordering it covered over, despite protest by the artistic community. 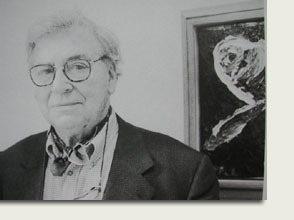 Since that time he has had one-man shows (including three major retrospectives) in New York, Amsterdam, Boston, London, Milan, Paris, San Francisco and Tokyo, and has participated in over 150 group shows throughout the world, including the Sao Paulo Biennale (Honorable Mention, 1953; Prize for painting, 1959), the Venice Biennale (UNESCO prize, 1954), Kassel's Documenta III, the Museum of Modern Art and Guggenheim Museum (Guggenheim International Award, 1960) in New York. Appel is also well known for his murals in Amsterdam, Paris, and particularly Brussels where he executed a mural for the Dutch Pavilion at the Worlds Fair in 1957. In 1960 he won the International Guggenheim Prize. Member of the Nordic School of Abstract Expressionists, who paint in a style derived from Jorn and de Kooning. Appel often paints ghostly fantasy pieces, using strong, vital colours. Like many of the Cobra artists he is fascinated by the art forms of primitive peoples and his female nudes often reveal a fetishistic quality. Appel has also been influenced by the Dutch Expressionists. His paint is often applied straight from the tube, with colour built up and layered. For a time Appel incorporated objects (such as puppets) in his paintings but he soon abandoned this in favour of more two dimensional work. He has also produced a number of sculptures at different times throughout his career. Characteristic are his large, coloured genealogical pictures.